About a year ago, my father and I were at Dudley Station. We needed a bus to get home, and we ultimately ended up taking the 66 (which also goes to Harvard, but with a much wilder route). I was interested in the 1, and my father and I were back at Dudley a few months later. But that time, we took the SL4 (why we took it over the SL5 remains a mystery) to South Station. A couple more months later, my father needed a bus from Harvard to the Boston Medical Center, and I suggested he take the 1. When he got back, he was raving about how amazing the 1 is. At this point, I didn't want to take the 1 - I needed to. Because of all these connections, the 1 is a Key Bus Route, meaning it runs about every 10 minutes on weekdays. My father and I were waiting for about that time at what we thought was Holyoke Gate. When the bus came with 12 people on it, though, we realized we were waiting one stop ahead. It didn't matter that much, though, and we got on with two other people. At Harvard Square, the 1 does a bit of a Figure-8. During this time, my father was telling me that Central Square was a huge hot spot, and 30 people got on when he rode. Turns out it was a much smaller number for our trip, but we were riding later in the day. 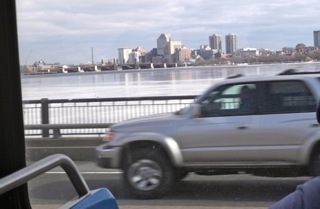 A few people got on and off at MIT, and then we went over the Harvard Bridge. My father was telling me that it was beautiful, and he wasn't kidding. You could see downtown Boston, the Longfellow Bridge (the one that the Red Line goes over), and plenty of ice (the river was frozen). It was definitely the highlight of the route. Getting into Back Bay, my father said that a bunch of people got off the bus at Hynes Convention Center. Again, we were riding later in the day, so not as many people got off. However, 40% of the riders got off at Massachusetts Avenue station on the Orange Line. The 1 crosses Washington Street, then makes a detour to serve the Boston Medical Center, where 60% of the riders got off. Rejoining the Silver Line, the 1 arrived at its terminus at Dudley Square. The view from the MIT Bridge. Too bad that car got in the way. Ridership: People making trips between neighborhoods or travelling crosstown. Not many people, if any, took the bus from beginning to end. The biggest ridership generators, it seems, are Harvard, Central, Hynes, Mass Ave (Orange Line), and the Boston Medical Center. It was relatively calm when my father and I rode, but my father said when he rode alone, the people were packed like sardines. Pros: A great crosstown route, and it's a good link between neighborhoods. 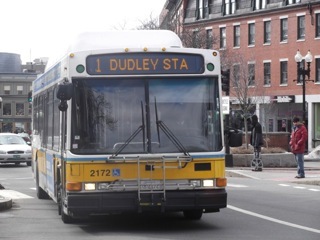 If you're going between Harvard and Dudley, the 1 is actually faster than rapid transit! Plus, it's worth the ride just for that view on the MIT bridge. Cons: It can be hard to find at Harvard, since it's separated from the busway. I've heard that it's prone to bunching, but that didn't occur with us. If the MBTA could spring for it, articulated buses would do the 1 nicely. This may sound like a lot, but the pros definitely outweigh the cons. Nearby and Noteworthy: So many! Aside from the places listed in Harvard, there's MIT, the Harvard Bridge, the Commonwealth Avenue Mall, Hynes Convention Center, the Mary Baker Eddy Library, Symphony Hall, Boston Medical Center, and BU (plus a number of other colleges). Latest MBTA News: More Orange Line shuttle buses between Sullivan Square and Oak Grove (Assembly Square had better be good, MBTA!) all day this weekend, as well as Monday through Wednesday starting at 9 PM. Also, don't plan on going to Orient Heights for the next seven months - starting March 23, Blue Line trains will be bypassing the station until mid-October. For more information, click here. I can't believe you rated this bus with only a 9. If this bus isn't a 10, then no bus is. I'm sorry I don't match up to your transit tastes. Why don't you start your own blog so YOU can give the bus a 10, hmm? IF you're going to ride the bus in Boston, this is the one to ride! You never know what you're going to get, how long you'll wait, and then how many options you may get. When I pick it up at Mass Ave and Beacon St during rush hour, I can usually pick between two, since they pull up at the same time. Oh, so it DOES bunch. I never like it when two or more buses come at the same time (there were once four in a row on the 77), but the 1 is still an excellent route. I remember once being on the #1 bus stopping at Boston Medical Center when this black guys announces, "This is where all the white people get off". He was right of course. The bridge is called the Harvard Bridge, even though it is near MIT. There is an extensive Wikipedia article about it, including the history of the name. Please correct your otherwise-accurate review. The route is indeed a Key Bus Route, but it suffers very badly from bunching due to heavy traffic.